"It's nice to host you in what I consider to be our living room. 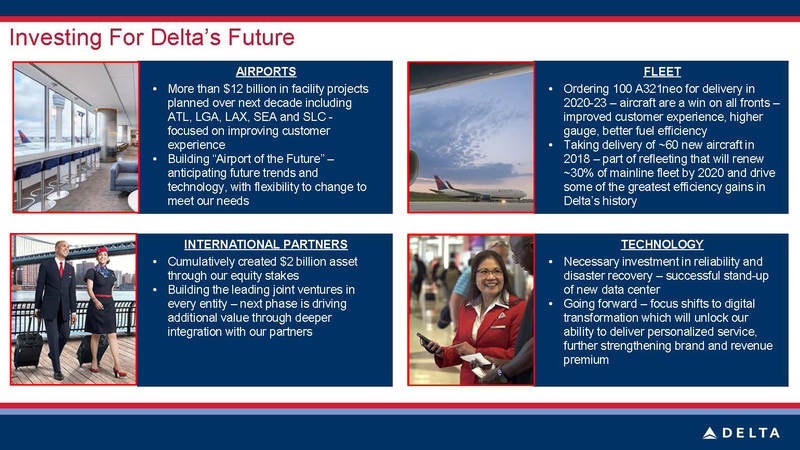 We're doing this presentation under the wing of the Spirit of Delta." 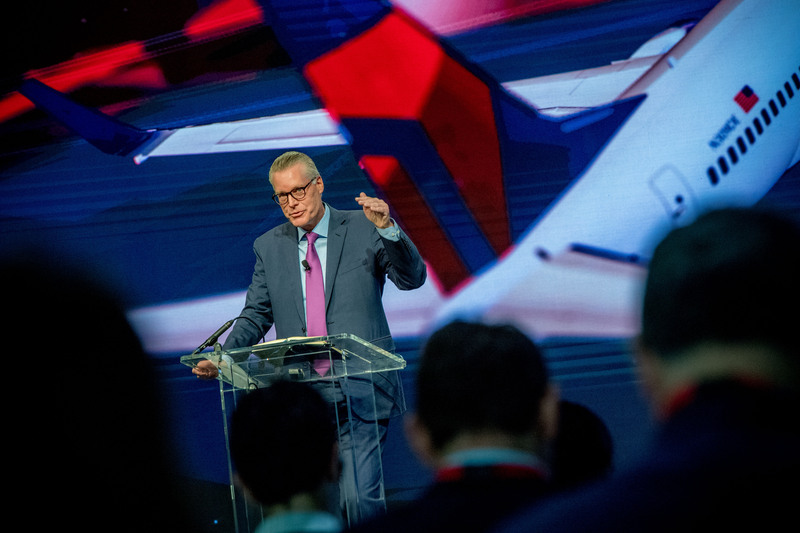 That's how CEO Ed Bastian welcomed more than 100 investors and Wall Street analysts to Delta's 11 th annual Investor Day, which was hosted at the Delta Flight Museum in Atlanta. It was the first time in recent years that the event, which typically is in New York, was held in Atlanta. 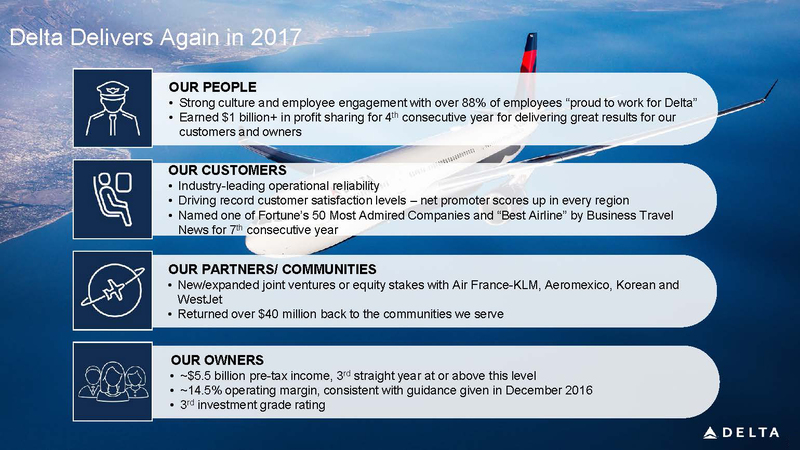 Bastian set forth many of Delta's key financial, operational and customer experience achievements during the year, noting that Delta people who drive these results are setting Delta up for its climb forward in 2018. He also strongly emphasized Delta's plan to curb unit cost growth in 2018 excluding profit sharing to between 0 and 2 percent in 2018 through a variety of productivity and efficiency initiatives. 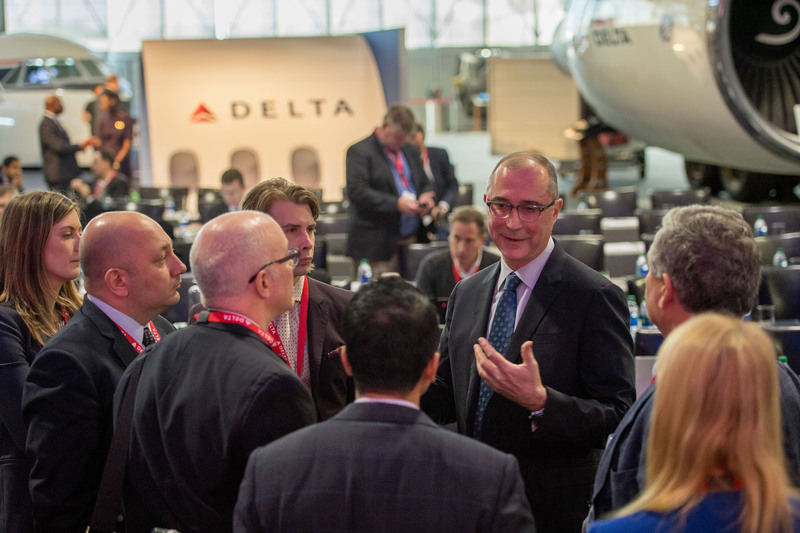 Bastian also mentioned Delta's order of A321neos, saying, "We think it's the best narrowbody aircraft product in the sky, not only for our customers, but for our people to work with." Before fielding questions from analysts and investors, Ed rounded out his comments describing how Delta has five strategic advantages that differentiate it from competitors, updated December quarter guidance and debuted guidance for 2018 earnings-per-share growth. Other speakers included Joanne Smith, Chief Human Resources Officer, who emphasized to the group that hiring the right people and reinforcing a strong brand as an employer will be key to keeping Delta's strong culture going forward. She also mentioned that Delta's Rules of the Road is a strong expression of values that guides the entire enterprise. "Rules of the Road is probably the best business book you'll read," she said. Chief Marketing Officer Tim Mapes discussed how Delta listens to customers and how growing loyalty to Delta's brand creates a durable revenue stream. "We listen with a bias toward action," he said. "We listen with a bias toward doing something more because we genuinely are concerned with your experience and getting you to where you need to go with a great experience." President Glen Hauenstein outlined Delta's revenue momentum, which is the best in years, and why the airline expects to generate positive PRASM in every quarter next year. That growth will be driven by Delta's network, revenue premium and its increasing globalization, with new and expanded joint ventures and investments expected to yield hundreds of millions of dollars in financial benefits. Chief Operating Officer Gil West said, "We truly have a culture of continuous improvement. This is something difficult to replicate – you not only need to have the hard skills to do it, but there has to be the people, the culture has to be receptive to continuous improvement. The organization really excels at that and people bring it to life." Paul Jacobson, Delta's chief financial officer, discussed initiatives to reduce non-fuel costs through efficiency improvements and fleet transformation. Fuel prices are expected to remain "relatively stable" next year, he said. "We have to find ways and innovate to find ways to address costs in ways we haven't done before," he said. Bastian closed out the event with a $25,000 donation presentation to the Atlanta chapter of Marine Toys for Tots. The donation was provided on behalf of attendees and was given in their name.